Two more contests this week! 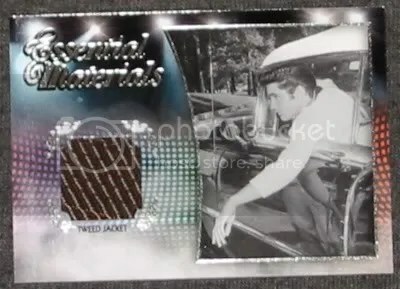 The winner of this contest will receive this 2012 Press Pass Essential Elvis – Essential Materials Elvis Presley Tweed Jacket Relic card. Are there any Elvis fans out there? Good luck!!! When you think of Press Pass, the phrase “cut signature” doesn’t always pop into your head. They aren’t known for making a lot of cut signatures for The Hobby and maybe thats a good thing. One of the few cut signatures they have made has popped up for sale. 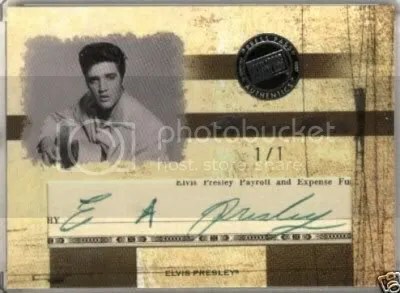 This one is of the King of Rock N’ Roll Elvis Presley and is serial numbered 1/1. It can be yours for the small price of $4,995.00.